Interview with Sara Devine, Director of Visitor Experience & Engagement at the Brooklyn Museum and adjunct professor for the Pratt Museums & Digital Culture M.S. program. 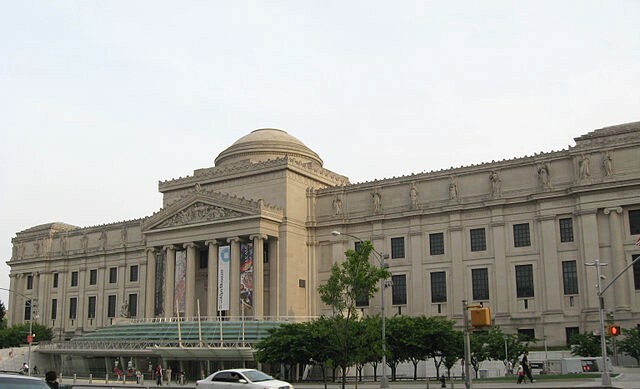 The Brooklyn Museum is one of the oldest and largest art museums in the United States, with a collection of over 1.5 million objects representing a wide spectrum of human creative expression, from ancient artifacts to contemporary art. It has been a leader in the museum sector for using digital technologies to engage their visitors, most notably through their ASK Brooklyn Museum app. To better understand the role that digital plays in the Brooklyn Museum visitor experience, I interviewed Sara Devine, the current Director of Visitor Experience & Engagement. Question: What led you to the museums & cultural heritage sector? Sara Devine: Growing up my parents always took my sister and me to museums and cultural sites. I didn’t go to an amusement park (beyond the state fair) until I was in 8th grade and didn’t get to Disneyland until I was 18. I’ve always been fascinated by stories, particularly the stories objects tell. In college, I toyed with the idea of becoming an archaeologist and completed archaeological field school in Pompeii summer before senior year. I loved it. Alas, the amount of schooling and the sheer number of languages required for a career classical archaeology wasn’t for me. An academic track just didn’t really appeal. I thought about what happens to objects once they are excavated and was reminded of museums. One of my college roommates chose a graduate program in museum education — which I didn’t even know was a degree option — and it got me thinking about a career in museums. I attended The George Washington University for Museum Studies with a concentration in exhibition development and public history. I’ve been working in/for/with museums ever since. Q: What led you to want to work with visitor experience specifically? SD: While I initially focused on the storytelling and delivery methods (interpretation) within an exhibition setting specifically, I had the unique opportunity to work with very seasoned designers, Barbara Charles and Bob Staples, on the exhibitions in the Monticello visitor center (my first job with business cards and benefits). Barbara and Bob thought holistically about the visitor experience — from typeface selection to cafe menus. That was my first introduction to broadening the scope of visitor experience beyond the walls of an exhibition. During my time at Hilferty Museum Planning & Exhibition Design, I had the chance to really delve into that broader idea and worked with clients all over the country on their overall visitor experience, including crafting interpretive master plans and developing exhibitions. The visitor experience is everything. I mean that in all possible ways. It’s our calling as well as our responsibility. What a visitor experiences with us, and how, is paramount. As a concept, the “visitor experience” encapsulates everything — from website to wayfinding, from staff interactions to interpretation. Collaborating with colleagues across departments to fit all the pieces together in a unified and holistic experience is the fun part of my job. Q: What is your current role at the Brooklyn Museum (BKM), and what does that entail? SD: I’ve been at the Brooklyn Museum for seven years and held four different job titles. Currently, I’m the Director of Visitor Experience & Engagement. My team and I are responsible for supporting and creating that holistic visitor experience. Responsibilities include admissions and coat check, wayfinding and building signage, group sales and tourism, our paid guided tour program, our ASK Brooklyn Museum app, audience metrics, and collaborating on engagement in-gallery and online. Q: How do you see digital being utilized across the institution? SD: Digital has been an important part of all of my roles at BKM, beginning with my first role as Manager of Interpretive Materials. Digital is definitely used across the institution — that’s true of any institution since we rely on digital technology to do our daily jobs, from collections management software like TMS to point-of-sale systems and email. Public-facing digital — such as the website, social media, our app — is shared across several departments including Technology, Marketing & Communications (Visitor Experience & Engagement sits in this department), Editorial, and Curatorial. Q: Does BKM have a dedicated digital strategy of kind? SD: Unfortunately, we do not have a holistic digital strategy, which can be a challenge, though digital tools and technologies are specifically mentioned in our strategic plan. We are taking steps towards creating a digital strategy, and leadership understands the importance of that conversation, but it sits among other priorities and goals so will take some time to get off the ground. Q: What are the main opportunities you see in upcoming digital technologies? Are there any platforms or types of experiences you are particularly inspired by or excited to explore for the Brooklyn Museum? SD: I’m most interested in using technology to help create experiences and engagement with art and ideas. It can spark conversations, get people looking more closely, and inspire wonder. It can also provide accessibility assistance. The possibilities are really quite endless. What I don’t want to see — ever — is technology for the sake of technology. If there is an analog way to accomplish an idea, I’m almost always going to try that first. One of the unique things digital can provide is data. Data is powerful and, when gathered and used thoughtfully, can provide great insight about what our visitors want and need from us. This is what I’m most excited about with our ASK Brooklyn Museum app. We’ve held over 20,000 conversations with visitors through our app since it launched in 2015. Our goal over the next 6 months or so is to really delve into the data we’ve gathered from ASK, which can provide insight into how visitors experience the museum, what questions they have about works of art, and more. We’ve already begun this process, with the help of our Pratt MDC Fellow Sydney Stewart, and I’m excited about what we can learn and how that might help not only us but the field in general. Q: You’ve referred to digital as being “part of the toolkit” for designing visitor experiences that can be used to enhance more traditional analog offerings. What is your process for deciding to implement a digital experience versus an analog one? SD: I base this process on the same one I used for exhibition development (Kathleen McLean and Beverly Serrell literally wrote the books on this), which is a series of questions, the answers to which guide the direction. Answers come from a variety of places including past experiences, visitor studies and audience data, and brainstorming with colleagues (which is the best way to go through this process). ● What’s the big idea? ○ Every exhibition, interactive, activity, label, video, etc. should have a big takeaway, one thesis that is the driving force behind the content. ● Who is it for? ○ Who is the audience for the experience? If there is more than one, which is often the case, think about shared characteristics as well as differences. It’s important to make sure the audiences find that connection, so you should offer different types of experiences based on audience needs…which brings me to my next question. ● What are their unique needs? ○ Once you define the audience, it’s vital to understand their unique needs and be thoughtful when designing an experience keeping those needs in mind. ● What kind of experience do you want to offer? ○ Not every experience is didactic, though that’s important too. Sometimes it’s about creating conversation or provoking thoughts, or just having fun. The key is to have the variety of experiences work together to make sure your audiences find something relevant to them. ● What are your assets? ○ Existing materials, content, research, partnerships, what things can you use to bring the ideas to fruition? This is the moment to think creatively about using resources to the best advantage. ● What are your parameters? ○ Defining what’s possible and what’s not helps finalize the approach as well. For example, if you want to provide an opportunity for visitors to understand a certain kind of painting technique, but you can’t have paint in the gallery, perhaps an app on a tablet will approximate the technique enough. Or perhaps you provide painting on a programmatic basis in another space. Q: In your current role as Director of Visitor Experience and Engagement, you work with a variety of different departments to present a cohesive visitor experience. How do you see this role fulfilling the mission statement of the Brooklyn Museum? SD: Absolutely. I work with all departments at one point or another and it’s one of my favorite things about this role since we have such amazing people here. I see Visitor Experience & Engagement as the glue that holds it all together. We are in a unique position to both set and execute initiatives as well as support our colleagues so they can successfully execute theirs. Q: Where do you see the most opportunity for digital engagement across the various touchpoints between the visitor and the museum that you are responsible for? SD: It’s such a basic thing, but for us, the biggest opportunity lies in a CRM (customer relationship management system). We don’t currently have one, believe it or not, and it truly keeps us from not only working efficiently but providing a seamless visitor experience across all our touchpoints. Thankfully, it’s included in our strategic plan so we will get there! Digital Engagement at the Brooklyn Museum was originally published in Museums and Digital Culture – Pratt Institute on Medium, where people are continuing the conversation by highlighting and responding to this story.